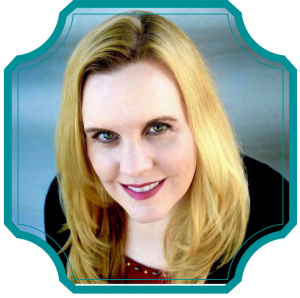 At twenty-four I went from childlessness to being an instant mother of six. I’d always wanted a large family, but the plan had been to ease into parenthood one child at a time. Through an odd turn of circumstances, my then-husband and I found our home filled with the delights of a mob of tiny humans, ages six months to nine years. I knew it was God’s plan, and my mothering instincts needed no convincing it was the right thing to do. I was dauntless although everyone else thought I was insane. Eight weeks into the process of foster-adoption, while also in the throes of planting a church, I made a startling discovery. I was pregnant. If that wasn’t enough chaos for a lifetime, I decided to home-school the four oldest children. It brought incredible joy to my heart to embrace this new life, but it also filled my house with pure pandemonium. As I limped and blundered my way through early motherhood, many people—mostly strangers—felt obligated to share opinions regarding family choices. “Don’t you know what causes that?” No. Can you please explain it to me? “Lady, are you nuts?” What tipped you off? “Ever heard of birth control?” Birth control? What’s that? “Which ones are yours?” Hello? All of them. “Do they ever see their real parents?” They only see their fake ones, I’m afraid. “Do you love your adopted kids as much as your own?” All my kids are my own. In reality, the ignorant and intrusive remarks were the easiest to manage. It was the compliments I struggled with. “I truly admire you.” Ouch. There’s nothing to admire here, believe me. “I could never do what you’re doing.” Doing? If you’re existing, then you’re nailing it. “These kids are lucky to have a mom like you.” These kids will be lucky if they survive childhood. “You have such a good heart.” I am so messed up. “You must be some kind of Wonder Woman.” Ah, my old friend Wonder Woman. Rewind twenty years. My first day of kindergarten was a dream come true, thanks to Wonder Woman. Captivated by the television series, I was savvy to the mysteries of Diana Prince and her secret identity. Imitation was my chief tool as I navigated the new territory of the red brick building and its surroundings. Many new students cried on day one, but I faced the adventure with eager delight. Nothing scared me because I was Wonder Woman, and that rendered me unstoppable. For weeks I soared around the playground in my invisible jet, saving friends and spying on enemies. Mission during recess number one: hide behind the bushes, take down pigtails, and twirl in a circle to ensure complete transformation. Recess number two’s mission: wrap up all operations, restore pigtails, and stash my golden lasso—a.k.a. fancy new jump rope—in a backpack. Twice a week my secret powers were at their peak because I wore my most prized possession, Wonder Woman Underoos. Imagine my shock the day I was required to abandon my covert exploits. I had lassoed a classmate, lacerating her arms and shoving her headfirst over a rock. I rolled her down the grassy hill until she cried for mercy. Dumbfounded, I sobbed when the teacher, Miss Gregory, laid me across her lap in order to administer the board of education. Didn’t Miss Gregory understand my line of reasoning? She found my logic faulty and left me with a sore backside. The Underoos offered no protection. Wonder Woman had let me down. I tossed her aside like a broken toy, passed my undies down to little sis, and determined to salvage my battered ego and find new endeavors. Over the years Wonder Woman morphed into a societal term synonymous with someone capable of doing it all. As an adult with seven, then eight, and eventually nine kids filling my life, folks assumed I had my act together. People looked at me in admiration as if I had real super powers. But if someone had thrown a golden lasso around my arms, the truth—along with a river of tears—would have come spilling out. Some days I aced homeschooling, but the house looked a wreck. In seasons when my home organization skills stayed on point, our classwork bordered on sloppy. If I focused on church activities, my waning energy left me emotionally unavailable for my family. When I made family a priority, I failed to meet external commitments and my own spiritual intentions. Whenever I concentrated on cooking nutritious and wholesome meals, my healthy family showed up for church mismatched, messy-haired, and even missing articles of clothing. Shoes and socks, anyone? On the days we arrived looking polished we had traded well-being for vanity. Pop-Tarts and donuts plagued my guilty conscience. In church circles, Wonder Woman looked suspiciously like the Proverbs Thirty-One Woman, the perfect model of a lady skilled at balancing everything. I cringed every time I reflected on how much I missed the mark. No amount of effort nor fanciful pretending would make me into something I could never be. The impossibility trampled me underfoot, and the downward spiral I experienced left me an emotional wreck. I failed to live up to everyone else’s expectations, and especially my own. 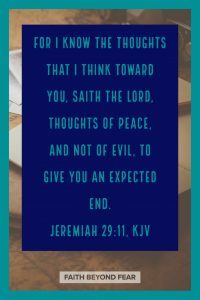 She quoted, “For I know the thoughts that I think toward you, saith the LORD, thoughts of peace, and not of evil, to give you an expected end,” (Jeremiah 29:11, KJV). I’d never understood that if God had a result in mind, then He was responsible to get me to the finish line. It would be impossible to dash His hopes if He was in charge of the outcome. Tears trickled down my cheeks before turning into an avalanche. In that moment it no longer mattered that I hadn’t achieved the standard of a mythical Wonder Woman. I could, with confidence, live in the plans God had laid out for me. Unlike my fictive heroine, my Father had never left me to fend for myself. Underoos paled in comparison to the armor of God. Most of my children are now adults. They survived. My mistakes and accomplishments had far less impact on the outcome than I expected. My kids arrived on the threshold of adulthood by grace alone. I’m thankful Wonder Woman is a mere role of the past, and no longer a self-imposed life goal. And when I glimpse those shiny red boots and flowing cape sticking out of my closet I say a prayer, shut the door, and remind myself I was designed for something far greater than a myth. Yolanda enjoys life in the foothills of North Carolina. In a “Yours, Mine & Ours” spin, she and her husband are parents to a combined total of twelve children and grandparents to a growing number of littles. Yolanda serves on her church’s worship team, works as a freelance editor, speaks at various churches, and writes in the cracks of life. She is currently writing her first novel featuring Appalachian historical fiction. A former member of a legalistic, cultish church, Yolanda is passionate about helping people find freedom in Christ. She is also enthusiastic about reading good books and correcting bad grammar. You may find Yolanda on Facebook, Instagram, Twitter, and Goodreads. Yolanda, thanks for sharing this freeing message. It is a timely message, and has hit the bulls-eye of my heart. Stephanie, thank you for your kind words. I’m so grateful someone else’s words released me from false ideas concerning my role as a woman in Christ. I pray The Lord will blossom this truth in your heart, sweet sister. Yolanda, this is so good. I love your humorous side with a touch of sarcasm and sassiness. I really admire being able to pull off sassy. 🙂 You rock! Your version of wonder woman sounds way more real. And your version of motherhood. I decided long ago to put away my heroine capes and choose the armor of God instead. My cape-wearing days are over. For my strength and courage come from the One who alone has the power to rescue. Thanks for this and blessings! Karen, that sass gets me in trouble as often as not. But God can use anything, right? I’m glad you found the source of your strength and courage long ago. The Lord was there for me even when I didn’t know how to rest in His love. I couldn’t have survived without Him, and I’m thankful He didn’t give up on me. The armor of God feels way more secure than flimsy capes and stretchy tights, right? Yolanda, I appreciate your honesty about motherhood. I have felt the same, that if I was balancing one area well, then others slipped through the cracks. 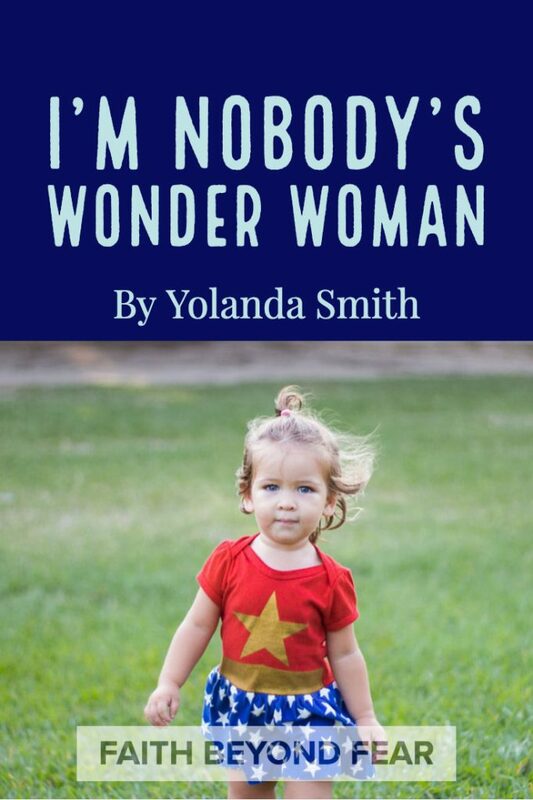 I love your conclusion “I was designed for something more than a myth.” Though we wish to be Wonder Woman, a humble spirit before God gives Him more to work with. God bless you and your beautiful family! Melissa, God’s faithfulness reaches beyond that unbalanced life, doesn’t it? If we had it all together, I guess we wouldn’t need Him, and that would be sad beyond comprehension. I appreciate you reaching out with those kind words. Many blessings to you. I love you. We just met, I know. But, I love you. 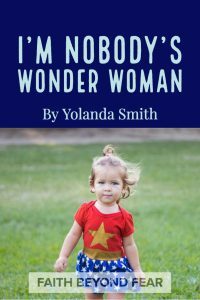 I was that mother, too, but they were all my own, and the freeing message that I could trust God with the outcome didn’t come until I was far, far, FAR into the challenge. I wish I’d heard this earlier: “I’d never understood that if God had a result in mind, then He was responsible to get me to the finish line. It would be impossible to dash His hopes if He was in charge of the outcome.” Like you, I took all of that on my own shoulders and about killed myself doing it. By the grace of God, I only hobbled away with an autoimmune disease, no one died, no one went to jail, and God mercifully taught us about grace, forgiveness, and faith in HIM, not in our own efforts. The legalistic road is a tough, tough TOUGH one to walk, for everything is our own fault and all the pressure is on us individually to do it right. Thank you for sharing so transparently. Somewhere, a young mother struggling along under the burden of the law will rejoice to hear your words and maybe take the first steps into grace. Even though it’s now decades since the Lord began applying the cure of grace and mercy, I still resonate with stories like yours/ours and thank GOD! for all he’s done and continues to do. Peace be with you, sister! for your heart, and for taking the time to share some of the similarities of our stories. Does anyone ever make it through motherhood without a limp? I think it’s our hearts, wrestling like Jacob, and God indeed blessing us. The “hobbling away” is a reminder of His faithfulness to help us finish the journey of His calling. I cannot tell you the freedom and joy I’ve tasted since trekking out of legalism, and I’m glad that’s your story too. God is amazing, His timing is impeccable, and his sweet grace covers all. You are SO funny! I cracked up in many places, but this line caused a burst of laughter out loud: “Doing? If you’re existing, then you’re nailing it.” That is SO true! Motherhood is not for the faint of heart, to be sure. And homeschooling on top of it? Yeah. Been there. Done that. Hardest thing I’ve ever done! All moms have a special place in God’s heart, I think. Great post – excellent humor and honesty! All moms DO have a special place in God’s heart. I’m glad I tickled your funny bone. I think humor is part of the motherhood survival toolbox, don’t you? Yolanda, your story is so similar to mine, including the comments. I totally understand how you felt. Thank you for sharing and reminding us we can not disappoint God, He is in control. Thank you for allowing God to use you to bless me today. Thank you for your kind remarks, Norma. It’s interesting how God brings us across the paths of others who have similar stories. I think it’s one of the ways He reminds us we aren’t alone on our journey. Amen. We can put on the Armor of God every day and know we are protected. We will have battles to fight , but we are blessed to have Him with us. Always, Melissa. We are never alone nor unprotected.